Today’s we come together to commemorate the Feast of St Thomas the Apostle, often nicknamed ‘Doubting Thomas’,because on Easter Sunday after Mary had seen Jesus, he went to the room where the disciples were and suddenly appears to them despite locked doors and they could clearly see the wounds to His hands and side. Jesus tells them, “Peace be with you”. The disciples believed. Thomas however, wasn’t with the other Apostles when Jesus had appeared to them, and when Thomas arrived after Jesus had left them, the other disciples told Thomas about Jesus visiting them, but Thomas didn’t believe, he told them, “Unless I see Jesus for myself, and can touch His wounds, I won’t believe.” I can easily imagine that Thomas may have thought the other apostles were teasing him; or why wouldn’t Jesus have stayed long enough until he had managed to arrive? Can you imagine what it would be like to be mainly remembered by many because of our greatest moment of doubt? Haven’t we all doubted at one time or another? I can tell you that I have once or twice. Thomas therefore, is the disciple to whom all of us can relate. Most of us have experienced what it is to live between faith and doubt at some point. Most people tend to think that Faith and doubt are opposites, but in true fact, it is often a part of our faith journey. It is a stop, or a bump in the road that most of us would’ve made more than once on our journey. This doesn’t make us bad Christians or believers. Indeed, rather, it can be seen as a sign that we take our relationship with God seriously that we allow ourselves to walk the journey of faith without knowing for certain through what we will be travelling. Christian tradition tells us that Thomas set sail for India and indeed was the first to spread Christianity there. He is the Patron Saint of India. The doubt that Thomas previously had, was what brought him faith and that faith was such that he brought the message of Christ to many. We all have times of doubt, at least all of us that see faith as a true journey, not a one=time stop gap. Doubt can actually propel us to faith, and can be what gives us the shake up we may at times need. It can be what sends us out of our comfort zones and into a new and better world. Doubt can act like a ticket that starts us truly on our journey to a whole new life of faith. It can be a sign of not the absence of God as many may think, but rather of God working within us to do something new. 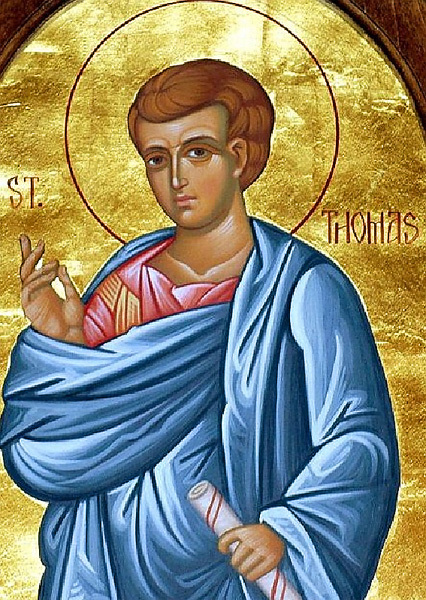 O Glorious St Thomas, your grief for Jesus was such that it wouldn’t allow you to to believe that he had risen until you saw him and touched his wounds. But your love for Jesus was equally great and it led you to give up your life for Him. Pray for us, that we may grieve for our sins which were the cause of Christ’s sufferings. Help us to spend our lives in His service and so to be Blessed, which Our Lord Jesus applied to those who would believe in Him without seeing Him.